There’s a history that isn’t listed on the History Channel. It seldom finds its way into books, or onto newsreels or biopics. It’s the history of persuasion. Today, we’ve become alerted to the ways in which the media influences our perspectives. Histories of the 20th century, however, often neglect its propaganda. We offer this collection as a correction. As Picasso’s Guernica has shown, in the 20th century the line between art and politics begins to blur. 79. Munkások! Polgarok! ("Workers! Citizens!"). 1912. 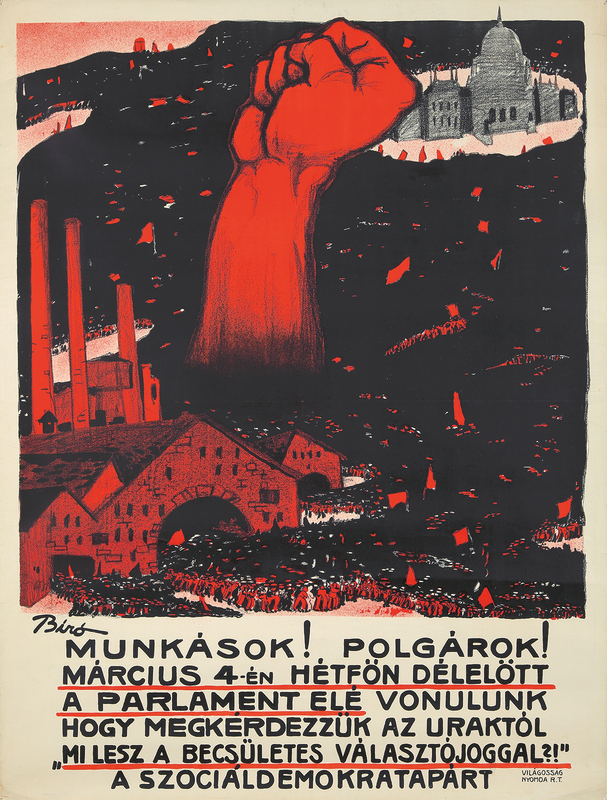 By 1912, industrial workers had become enraged by the autocracy of the Austro-Hungarian Empire. State authorities abused the law. The vote was more or less restricted to male land-owners. And the working class knew that the state was stoking the fires of nationalism in order to suppress democratic-socialist ideals of the working class. By May 1912, Budapest saw its worst riots since the failed revolutions of 1848. By 1914, the world was at war. 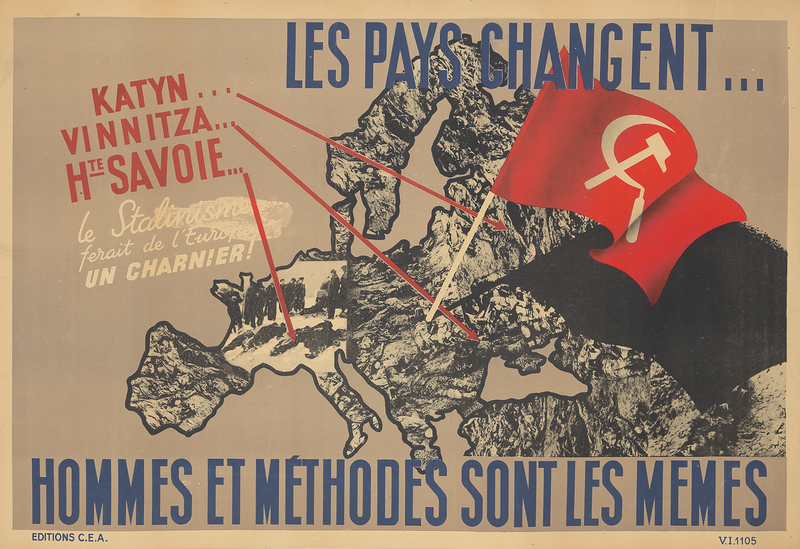 The artist, Mihály Biró, was really the first visual propagandist of note – and his iconic emblems (the Red Fist, the Bound Giant, and the Red Man With Hammer) became potent symbols for socialist movements in Europe from the 1910s onward. See more of Mihály Biró’s work here and here. 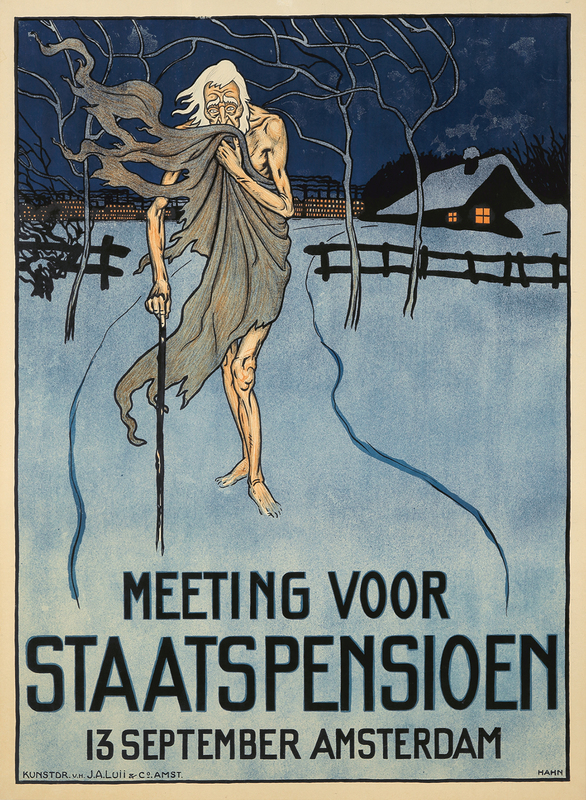 In late 19th-century Europe, old age meant poverty, almost invariably. Fifty years later, in 1956, The Netherlands had secured an old-age state pension scheme to provide some security to anyone who’s lived or worked in the country. It took 50 years of constant pressure to win the latter state from the former. This poster was a powerful ally in that fight: a message compelling citizen organization ahead of the first major breakthrough, the Invalidity Act of 1913, which created a social-security provision for invalidity or early death of the breadwinner. Today, The Netherlands’ pension provisions, which include a mixture of private and public benefits, are among the most progressive in the developed world. “Cry ‘Havoc!’, and let slip the dogs of war.” Ferdinand Kruis mobilizes Shakespearean shadows for this great and awful image, created in the service of the Kaiser. 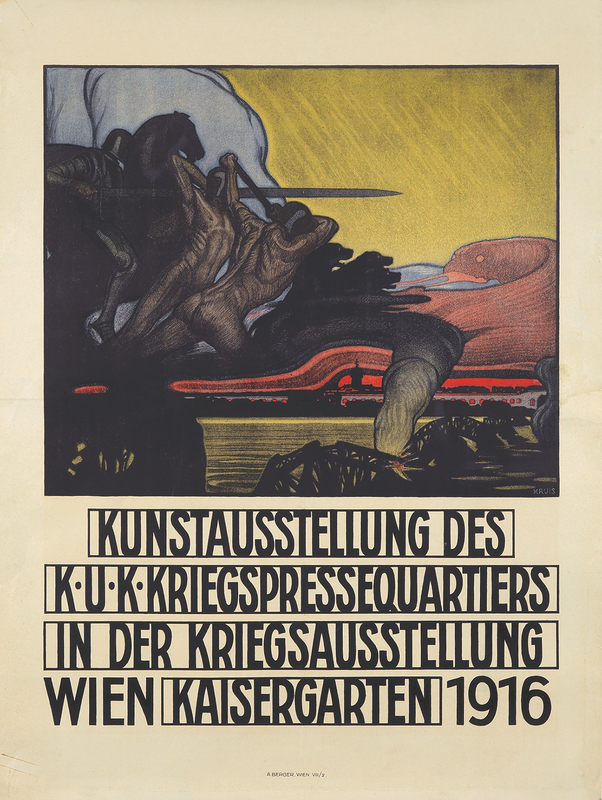 This poster advertised an exhibition of war art at Vienna’s Kaisergarten in 1916, meant to stir up patriotic fervor during the Great War’s most critical point – the Battle of the Somme. This battle, which saw the first uses of tanks and planes in combat, incurred 1.5 million casualties. 103. Durée du Travail. 1920. “Our responsibility is great. Help us to support it! The Hours of Work Act – YES” – Throughout the First World War, Allied governments began implementing eight-hour workday limits, incrementally, in part to reduce socialist workers’ agitation. Between 1913 and 1919, French Prime Minister Georges Clemenceau expanded the law, first for miners, then to all those employed upon French vessels, and finally to all classes of workpeople. However at the end of 1919, France’s new electoral system meant that Clemenceau would cede the office of President to Paul Deschanel in 1920. 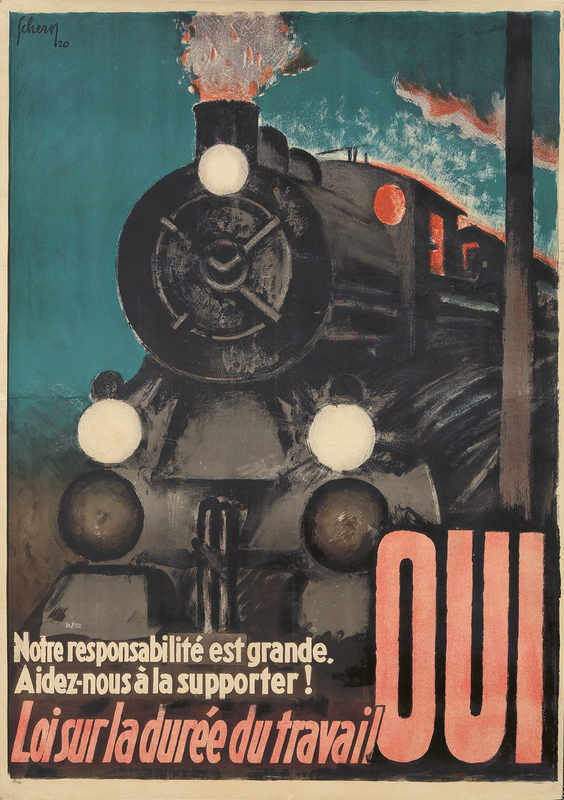 This riveting, Expressionist-influenced poster argued for maintaining the new legislation, especially for railroad workers, by dramatically portraying the huge mechanical beast of the locomotive, which (as we see all too well today) becomes a mortal threat in the hands of an overly exhausted driver. “The spoilers… always come from the same nest.” It’s painful to post this image on the same week that 500 Jewish headstones are overturned in Pennsylvania, but the propaganda strategy deployed here should be recognized as a pattern. 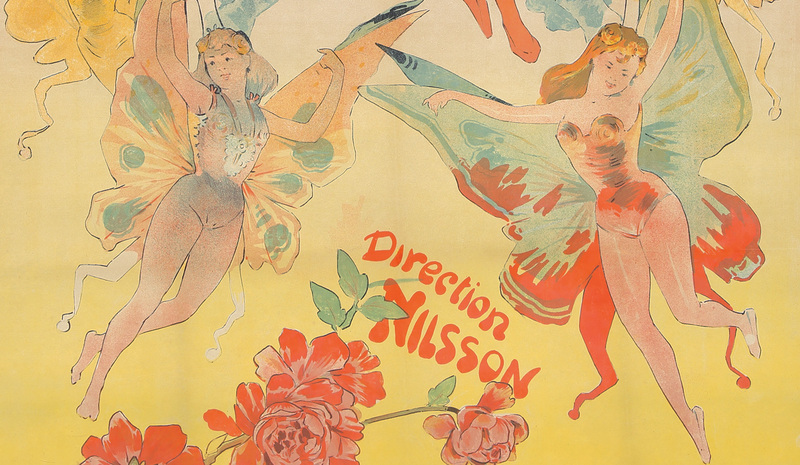 This Vichy propaganda poster was printed to counter Free France propaganda. 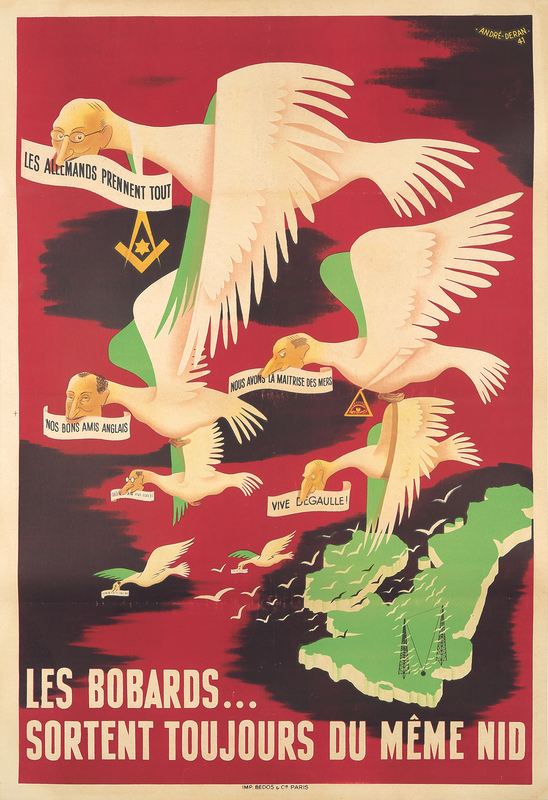 The birds, with human faces and hooked noses, carry messages: “The Germans take all we’ve got”; “Our friends the English”; “We control the seas”; “Vive de Gaulle.” England is in the lower right corner. This poster is now in the permanent collection of the United States National Holocaust Museum. 111. London Underground / Seeing it Through: Firefighters. 1944. One of Britain’s most significant war artists, E.H. Kennington’s work now hangs in the Imperial War Museum; his bust of T.E. Lawrence (Lawrence of Arabia) is in St. Paul’s Cathedral, and his drawings illustrate T.E. Lawrence’s “Seven Pillars of Wisdom.” Anticipating World War II, he planned camouflage schemes for London’s most prominent landmarks. 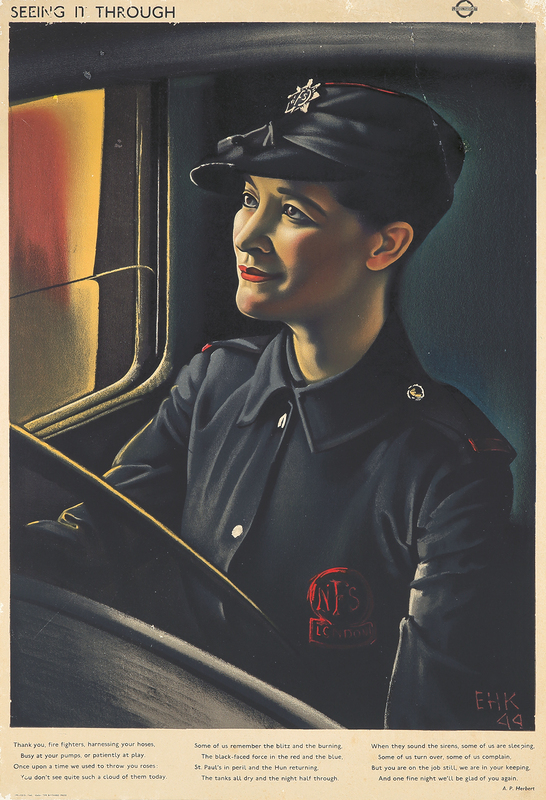 One of two posters we’re offering from Kennington’s “Seeing it Through” series for London Transport (also see Lot 110), this one champions firefighters – and it addresses a curious side effect of Londoners’ famous “Keep Calm and Carry On” attitude: a compartmentalization of mind. By 1944, it’d been four years since the Blitz. Like the years after 9/11, life had returned to ‘normal’; as A.P. Herbert’s poem reads, “Once upon a time we used to throw you [firefighters] roses; you don’t see quite such a cloud of them today… But you are on the job still, we are in your keeping, / And one fine night we’ll be glad of you again.” In September 1944, London was terrorized by V-2 rocket attacks; the poem’s sentiment dates this poster to 1944’s earlier months. 113. We'll Finish the Fascist Beast. 1945. “We’ll finish the fascist beast in his own cave!” This propaganda poster, commissioned by the Red Army in early 1945, had a very clear understanding of how the end would have to come for Hitler. Sandor Bortnyik, the artist, found himself among Weimar, Dada, Constructivist and Bauhaus movements in the early 1920s, but considered himself an outsider and took a critical perspective on the movements, before founding and directing a Budapest school of advertising design from 1928-1938. 114. Hommes et Methodes Sont les Memes. 121A. Made in USA. 1983. 122. Shield of America. 1985. 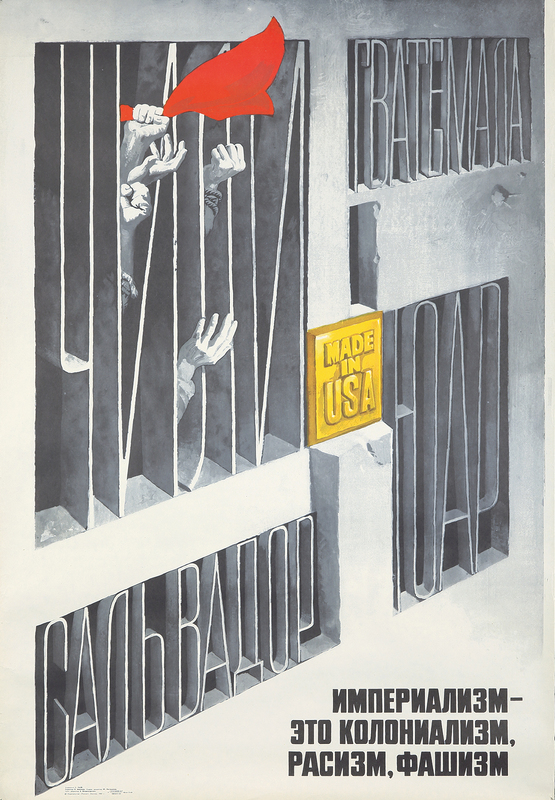 This Soviet propaganda poster, produced in the first year of Mikhail Gorbachev’s leadership, decries American nuclear proliferation and calls out what it regards as the hypocrisy of ‘the best defense is a good offense.’ “This is the shield of America,” it reads. 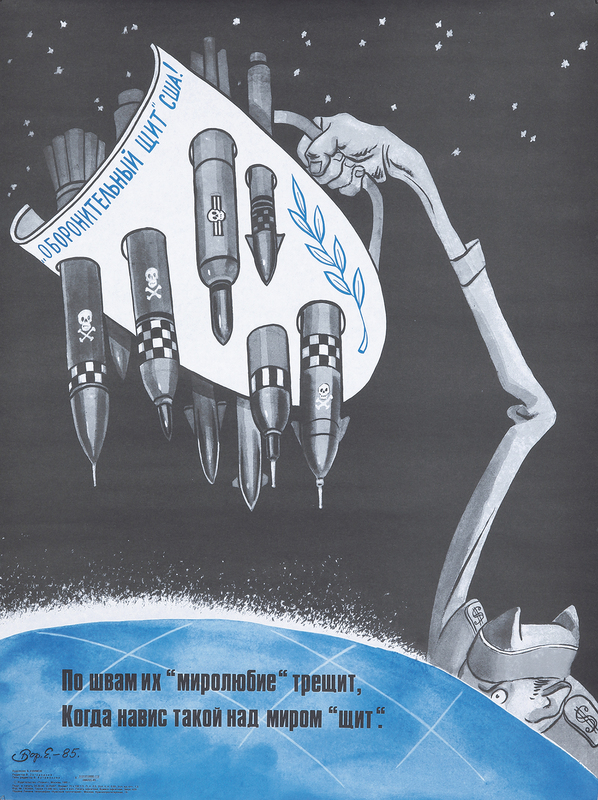 In blue, below, with an icy irony: “Their peacefulness is bursting at the seams, it’s breaking up all over the world.” On the bottom right you can see the dollar sign epaulette upon the American serviceman’s skinny arm, holding up a shield bristling with nuclear warheads, like a teacup he’s about to tip over upon the globe. Artist’s signature is not clear. 124. Imperialism is Hunger, Poverty, Unemployment. 1983. 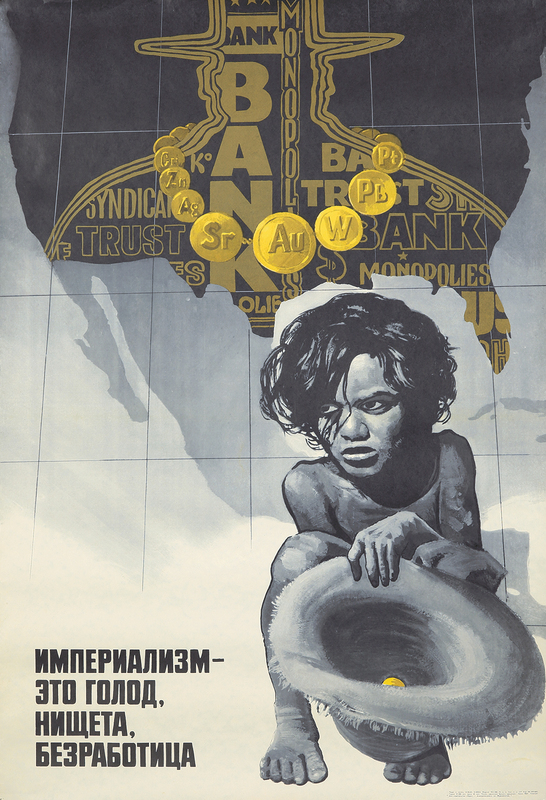 A Central American beggar child, hat in hand with a single gold coin in it, looks left with accusation toward the text: “Imperialism is hunger, poverty, unemployment.” Above, a silhouette of a man hovers over the southern and Midwestern United States, his outline filled with the words “Bank,” “Syndicate,” “Monopolies,” “Trusts.” The pendants draped around this banker’s silhouette correspond to symbols for precious metals (from left to right): copper, zinc, silver, strontium, gold, tungsten, lead and platinum – all critical elements for technological, military, and economic leverage. All of these elements fuse into a single powerful message that “Western imperialism” exploits the natural resources of nations while impoverishing their people. 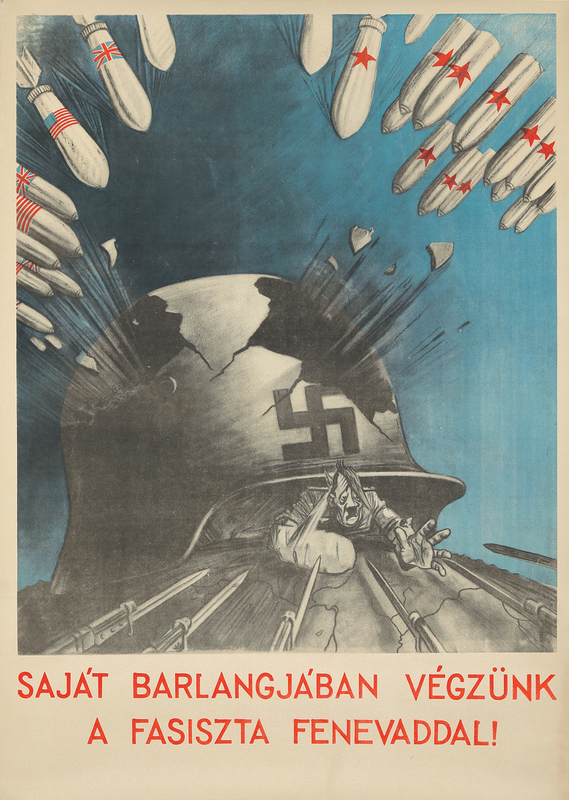 Our extraordinary collection of 48 rare propaganda posters can be viewed here.